A small town of Himachal Pradesh, Manikaran is nestled between the mountains and is located at a distance of around 45 km from Kullu. 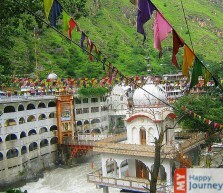 A place of holy importance for Sikhs and Hindus, it is visited by a large number of people every year. This place is a source of ecstasy for religious people, as it has so much to offer. The main attraction of this small town is the Sri Guru Nanak Dev Ji Gurudwara. One of the most esteemed Sikh pilgrimage sites in the country, this place is believed to be visited by Guru Nanak Dev Ji with his followers. Another attraction is the temple of Lord Shiva. An inimitable facet of this temple is that it became slanted after a colossal earthquake of 8.0 magnitudes on the Richter’s scale, occurred in this area in the year 1905. Next in the list of sacred places is the temple of Lord Ramachandra. As per the legends the idol of Lord Ramchandra was brought from Ayodhya and was housed here by the Raja of Kullu. Along with the idol of Lord Rama, the temple also houses the idols of Sita and Lakshman. However the idol of Lakshman is missing now. One can have the glance of the history of this temple through the walls of this temple, as everything is engraved on these. The hot springs in this town are undoubtedly the main attraction. Large numbers of devotees especially come here to take a dip here and drink the water from these springs, as it is believed that this water can help you achieve Moksh. Moreover, as the hot springs here are rich in Uranium and many other radioactive compounds, thus it is very rich in therapeutic properties as well.